It's the end of Feeding Tube Awareness Week 2017 which means another year has passed since Bella had her feeding tube removed (nearly 2 years ago now). For us this week is also a time to reflect on our time with the tube, what we have been through and think about how far we've come since. We still have absolutely no regrets whatsoever about having had the feeding tube or the timing that we got it removed. (We did about a year ago wonder if we had made the wrong decision by getting it out when we did as she has been touch and go with failure to thrive at times). So how are we traveling these days? Bella still drinks her elemental formula twice a day (morning and night). This supplements her food intake which alone will not meet nutrition and vitamin needs. This is due to her multiple anaphylaxis allergies (milk, egg, fish, chicken) and her EoE triggers (wheat, soy, peanut, corn) and many food aversions. Due to her current medications that have been helping keep her EoE symptoms more under control she is currently trialling some corn (as an ingredient at this stage, not whole corn products). That has opened a few exciting new food options for her and we’ve also seen a huge increase in recent times in the quantity and variety of allergy friendly foods available! A massive difference that is for sure to what it was like 12 years ago when we began on this journey. An ongoing battle for us and one that we have tried to get help with again last year but have had to put on hold until she is ready is that she most likely also has Avoidant / Restrictive Food Intake Disorder (ARFID). It never used to have a name for it when she was younger! But for now, we are celebrating the steps we’ve taken already and are thankful that she still has her Cheerleading to guarantee a smile on her face! Nearly One Year On and it's Feeding Tube Awareness Week! Bella is now in high school and it has been nearly one year since her feeding tube was removed. As it’s Feeding Tube Awareness Week I thought it was time to give another update on her story. Unfortunately for Bella, in July last year circumstances changed and her cheerleading stunt partner, Jarah left the cheerleading gym to prepare to try out for a worlds cheerleading team. Bella shares the same dream as Jarah but she'll have to gain a lot more strength and build on other cheerleading skills, like tumbling to achieve this. I know she will never give up on her dream though. It was really hard for Bella when Jarah left as she did look up to him like a big brother but I believe everything happens for a reason and what’s meant to be will be! So life went on and Bella continued training with her cheerleading team and her lovely coach found a new stunt group for her to continue training and competing with, and these three girls were very supportive and Bella had a lot of fun competing at 8 competitions including Nationals in Melbourne! What an eventful and busy year 2015 was! Now we are in 2016 and a new cheer year is already in full swing with Bella in a cheerleading team and a stunt group once again and this time with the plan to compete in 10 competitions throughout the year! She trains 3 days a week so it's become a big commitment with travel to and from cheerleading but we wouldn't have it any other way as it’s still the best thing for her. We have no regrets in having the tube removed but in many ways life is harder for her now as she is still reliant on supplementing her limited diet by drinking the Neocate to meet her nutritional needs. The complexity of her medical condition means that unfortunately she isn't thriving yet and her eczema returns when she is eating more foods and having less formula which is the most healing nutrition for her body. So she is currently drinking 1-2 cups of Neocate each morning before school, having a packed lunch at school as well as safe hot food from the tuck-shop (which I must say they have been fabulous arranging to have safe food options for her) and then 2-3 cups of Neocate after school and up until bed time. It was a big risk we took with her having her feeding tube removed before she was ‘thriving’ on her own and it’s touch and go really with her still being at risk of needing a feeding tube inserted into her nose if she doesn’t continue to put on weight. This is something Bella is desperately trying to avoid. I wish I could say everything turned out great but unfortunately I can’t. It’s tough and it will take a lot of hard work and dedication to both her health and her sport for her to achieve her dream. Her motto ‘Never Give Up’ is now more important than ever. Tube Weaning and for the love of Cheerleading! It’s been a long time since I’ve posted to this blog. I had all intentions on writing a Tube Weaning Blog but never got around to it! Well here goes with an update on Bella and the exciting news that she is now tube free! I write this with tears in my eyes because it’s hard to put into words the massive impact that a passion for sport (Cheerleading!) and meeting a special person has had on Bella’s life. As you know Bella has been living with the rare disorder called eosinophilic oesophagitis all of her life. 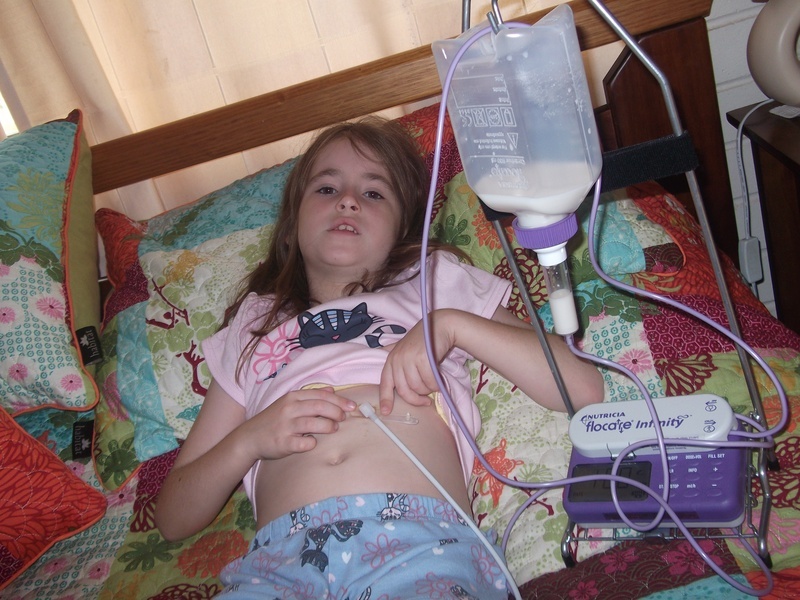 When she was 7 years old the difficult decision was made for her to have a feeding tube inserted in her stomach (hence the start of this blog). For nearly the last four years she has received 90% of her nutrition from an elemental formula through a feeding pump 10 hours a night. This disorder affects both her physical and mental health. Thanks to the feeding tube she began to have enough energy and strength to participate in sports and in 2013 chose cheerleading as her passion. 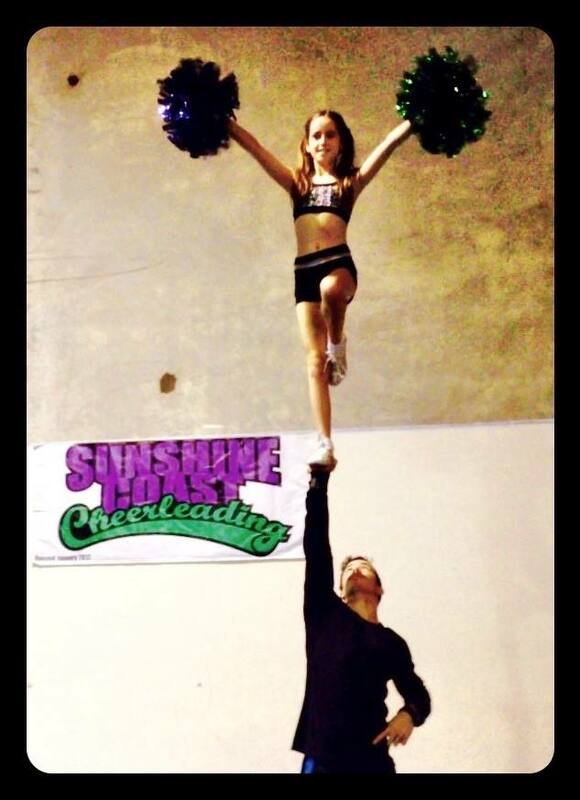 As she is petite for her age she was a flyer for her Level 1 cheer team. Cheerleading became her life. She lived to fly. She enjoyed the excitement and challenges. But she was still plagued with self-esteem issues as she compared herself to everyone else and felt inferior and hindered by her feeding tube. She dreamed to be able to wear a cheerleading crop top like her team mates. Last Christmas school holidays we decided to go ‘cold turkey’ from using her feeding tube and try to eat enough of her limited diet (with vitamin supplementation). It was hard, very hard. But Bella had a goal in sight. She wanted to get her feeding tube out and fly even higher in cheerleading this year without it. Then her cheerleading gym had their team try outs. Bella was placed in a team, but not as a flyer. They did not have a spot for her as a flyer this year. Bella was devastated. She wanted to quit. She wanted to quit on life. Cheerleading was her life. It was the one thing that she had in her life that gave her enjoyment. When she was flying, she felt on top of the world. She wasn’t thinking about the next medical appointment or the next tube feed when she was in the air. As a mum you do anything to help your kids succeed, but when you see them hit rock bottom, you hit rock bottom too. I searched our local area for other activities she could participate in; Gymnastics, competitive Aerobics, Ballet... She just wanted to fly. Thankfully I persisted and found another cheerleading studio (Sunshine Coast Cheerleading) that was half an hour away (compared to 5 minutes away) and we met Chantelle the owner and one of her coaches Jarah. As soon as they met her they knew she was born to fly. They welcomed her into their studio with open arms, along with the rest of their cheerleading family. They accepted her for who she was and not only did they place her as a flyer in a cheerleading team, Jarah asked if she wanted to partner stunt with him. Not only was she flying again, but she began to soar. Even with a feeding tube, she was, in just a few days of practice trying and nailing Level 5 stunts! With this new motivation and encouragement she now had an even stronger determination to succeed so she began to drink her elemental formula again. Now that she was drinking her formula again she was back on track to getting her feeding tube removed before the first cheerleading competition in June this year. We had planned on scheduling the surgery after Easter but Bella fractured her wrist skateboarding so as she was unable to train with her wrist in a cast we took the opportunity to get the tube taken out sooner so she wouldn’t have to miss too much training (cheerleading after all is her motivation). So on the 3rd March, Bella underwent the surgery to remove her feeding tube. I’m very thankful that we had taken out private health insurance a few years ago as I was literally given an appointment the following week from when I phoned the surgeon! Two weeks ago she had recovered enough from both the feeding tube surgery and the fractured wrist to start her partner stunt training with Jarah again. She wore a crop top for the first time and was not embarrassed of her scar - it's now a badge of honour for what she has been through. In some ways it will be harder for her now as she is still reliant on supplementing her limited diet by drinking elemental formula to meet her nutritional needs but it will be easier for her to pursue her cheerleading dreams and that makes it all worth it. We will be forever thankful to Jarah (pictured here with Bella). The power of cheerleading has changed our life! Stay tuned as Bella’s aiming for Olympic gold in the future if Cheerleading ever gets accepted as an Olympic sport that is! On Saturday we went to the dietitian for Bella's regular check-up and were very happy to find out that we have passed another weight milestone! For the first time in Bella’s life her weight on the percentile chart is higher percentage than her height! We’ve decided to cut her night tube feed to 800ml so that we can balance it up a bit. She still has one 200ml tube feed at school during the day and enjoys the one-on-one time with her teacher aide. Overall she's growing well with the tube feeding, has lots of energy and is looking fabulous! In the last couple of months we have introduced tube feeding at school also. This was arranged with the district school registered nurse who trained a teacher aide to take on this task each day. She’s doing a fantastic job! It was a bit of a hurdle at the start as we had to get the location, timing, equipment, practice etc. all sorted but the procedure is all in place now and working really well. Bella was also quick to notice a change in her energy levels at school - play time is now for playing! They feed her during school time, just before lunch break so she doesn't miss out being with her friends. She doesn't eat any food at school, instead she gets one 200ml tube feed via bolus syringe each day at 12.30pm, she does eat a small dinner at night and is still continuous tube fed 1ltr Neocate Advance 10 hours per night via the infinity pump. Our next step is next Wednesday she is scheduled to have her first BARD button change, via endoscopy. This should just be a day surgery and the plan is to be able to start feeds again and go home the same day. She's a bit anxious about it being her first button change, and it has also been 18 months since last endoscopy so will give us an update on how her EoE is looking. She's been trialling wheat presently and is on flixotide daily. It will be interesting to see if the results mean we can keep the wheat in her diet, although her eczema is flaring enough to make us think we shouldn’t be continuing with wheat anyhow. Hi, it’s me Bella again. I just wanted to say that now I have got the TT that I call it my button. Every single night I have to clean it, there is also a thing called granulation tissue that comes around it but Mum puts cream on it. I feel much better with my button then I used to feel and if you are like me you might want to ask your Mum for one. I like not having to drink my milk anymore and I don’t get sleepy at school anymore. Here is a picture of me and my pump. We have more excellent news to share – Bella has well and truly passed 20kg!!! In the school holidays we visited the dietitian again and she was 20.7kg. She has finally passed the weight of her 6 year old sister Olivia (2 year age difference but has weighed the same as Bella for as long as we can remember). We had a little 20kg party when we reached this milestone!! • How does stray hair manage to keep getting itself wrapped around the button? We are so thrilled - Bella has put on 2kgs since we started tube feeding. She is now 19.6kg!!! She is moving towards the 10th percentile when she has been on the bottom or below the chart all her life. Everyone who knows her is saying how well she looks and in her words "I've never felt so alive before". It's the new boundless energy that has had the biggest impact. The feeding process is still going well, we’ve only had a few very minor hiccups that have been easily resolved (things like learning to sticky tape the tube connectors together to avoid them coming apart mid feed and causing a big leaky smelly mess – Bella was not impressed with the midnight showers!) We are averaging around 900ml a night normal strength Neocate Advance through the tube, she rarely drinks a cup orally anymore. We haven’t noticed a difference either way with appetite increase/decrease so Bella is still eating her small amounts of safe foods during the day. Well we’ve been tube feeding for one month now so I thought it was time for a progress update. We started off with slow feeds at 20ml an hour rate through the pump and then slowly increased rate over a couple weeks until we have now reached a feed rate of 90ml an hour in which she is tolerating very well. We are only feeding through the night by pump for 10 hours – 2 continuous 5 hour feeds of 450ml each which is 900ml a night. A little bit short of our goal of 960ml a night but she is about ready to burst when she wakes up in the morning with her being able to taste the water when we flush the tube after the feed so we are leaving it at 900ml for now so as to not push it too far and have her vomit! We haven’t done any bolus feeds yet as she is still eating her regular amount of food and sometimes drinks a Neocate during the day too. In the first week of tube feeding she had to be weaned off drinking a Neocate during the night – she would wake up and want one and I’d have to remind her she was having it through the tube! It was a habit formed over the 6 years where she would want the Neocate for comfort sake not just for nutritional need so whilst now we still encourage her to drink a cup of it so she doesn’t lose the taste tolerance for it, she is no longer asking for it for comfort sake. This is another bonus as she is 8 years old this month and a little bit old to be demanding milk when things aren’t going her way or when there is chores/homework to be done! We didn’t really have much choice before as we needed her to have it whenever she would because of her constant battle with failure to thrive. Last week we went to the dietitian for our first review post tube and Bella was 18.1kg so we have had some small weight gain already! The other thing we’ve noticed is the increase in her energy levels – it has been astronomical the difference in her, especially with being on school holidays and we have been on the go a lot with activities and having family visitors and for the first time in her life she didn’t need constant rest periods with Neocate to give her energy boosts. Even though she is still eating only small amounts of food the 900ml at night just gives her the energy to last the whole day and she wakes up practically jumping out of bed when she used to wake up still tired (she is also jumping out of bed to rush to the toilet, the only downside of having 900ml a night!). The last month has been a time of big adjustment for Bella. Her anxiety has been heightened and she has been constantly worried about the button falling out, leaking etc. but thankfully she’s slowly getting more comfortable with having the button. For the first couple of weeks she wouldn’t even walk straight, or look at herself with it and was showering with her eyes closed so as not to see it, it was heartbreaking. Now just within the last week we’ve had little breakthroughs of acceptance, like she walked from her bedroom to her sisters the other morning carrying her own pump next to her (before that she would just yell out for attention refusing to move from her bed when being fed). Then just yesterday I found this cute little drawing she drew of herself wearing a t-shirt that says I HAVE EE and she drew her button and a tube going to a pump and she wrote this little note next to it “Sometimes people can have tubes. Me I’ve got a tube it’s not that bad. If you have EE you might need one”.